These are Magic Letters. As you can see, I am only missing a few from having a complete set in "white." I am only missing five from a complete set of 35 in yellow, and four from a set in pink. 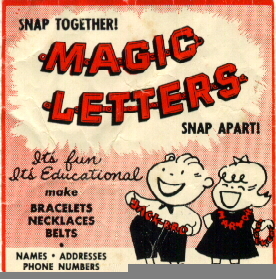 Click here to see the eight different colors that Magic Letters come in. The advertisement above is a paper label. I think it would have been used as part of a header in a gum machine.